Fuzzy Planet is an online community for children in grades K-8 who want to make a positive impact on the world. From helping kids learn how to run a book drive to giving them tools to design solutions for clean water or energy, Fuzzy Planet endeavors to empower kids to build their own world for the betterment of humanity. Kids choose the challenges they want to tackle and share on the site, and the possible topics span both STEM and the humanities. Currently a pilot site, Fuzzy Planet’s long-term vision is to help its explorers share their discoveries, complete challenges, and embark on journeys through project-based learning, peer collaboration, and subject matter expert mentorship. Location-based, or geolocative, augmented reality (AR) games have the power to forge connections between these grand challenges and their local communities, enabling young players to engage with a topic or issue through playful, yet meaningful, gameplay in real-world locations on their mobile devices. As AR players move around the game space, their location-aware devices embed them within a narrative context, enabling them to interact with virtual characters, objects, and data interwoven within the player’s real-world location. The MIT Scheller Teacher Education Program and the Bryan Johnson Foundation are developing a pilot project that uses a location-based AR game for middle-school youth to explore key ideas of global climate change. The game, developed in close collaboration with climate change educators, blends fact and fiction, challenging players to use newly discovered powers to understand problems, gather information, make decisions and move through the narrative, seeing the consequences of their decisions and gaining a deeper understanding of the complex topic. The game is being designed to leverage specific aspects of a location (a suburban Boston-area town center), while at the same time remaining capable of being relocated with minimal effort to similar urban or suburban locations. As more grand challenges emerge, new educational approaches are needed to frame these problems and prepare the next generation to solve them. 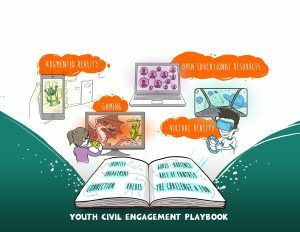 Games and play-based approaches, including augmented reality, are especially attractive to youth and effective in fostering civic learning and engagement. The Bryan Johnson Foundation and the MIT Education Arcade have prepared a white paper that synthesizes the current research on play-based approaches for civic learning into eight principles for game design. These principles include balancing the role of fantasy, creating peer engagement, and promoting enduring connections to people and places. The paper also encourages community partnerships and networks to best support young people’s emerging sense of themselves as changemakers. The playbook will serve as a resource for educators, game designers, and policy-makers. To learn more about the Foundation, contact us.